The Preservation Greensboro Development Fund is seeking a buyer for a historic rehabilitation of the Frank Leak House at 909 N. Elm Street in Fisher Park. The asking price is $330,000. The badly neglected 4,000 square-foot house has been vacant for 10 years. Its most prominent features now are the temporary supports propping up the front porch. The fund acquired the house in February through a foreclosure sale. The property will be sold subject to a rehabilitation agreement and a preservation easement. Further information and an application form to be considered as a potential buyer are available from the fund. The application deadline is Monday October 2, 2017 has been extended from its original date of October 2. Contact Preservation Greensboro for details (336-272-5003). County tax records list the date of the house as 1914. The listing shows four bedrooms and four bathrooms. It also gives the square footage at 5,700, which appears to include the unheated attic. The Preservation Greensboro Develoment Fund is a sister organization to Preservation Greensboro. It works as a “revolving fund,” a pool of capital created and reserved for historic preservation activities with the condition that the money be returned to the fund to be reused for similar activities in the future. Properties sold through the Fund hold preservation easements to protect their significant architectural features. The Fund has assisted in the restoration or conservation of properties in the Cedar Street, College Hill, Fisher Park, Glenwood, Irving Park and Southside neighborhoods. It also has assisted in planning projects in the Summit Avenue and Southside neighborhoods. It has served other Guilford County communities as well, including High Point and Whitsett. Update: Hillsdale Farm sold for $2.335 million on February 14, 2018. If you want to buy a great big piece of Greensboro history, you can’t go much bigger than Hillsdale Farm: a 13,500 square-foot home and 27 acres of wooded land overlooking Lake Brandt. It’s yours for $2.875 million. The property includes the mansion with eight bedrooms, six full bathrooms and two half baths, and an indoor pool; greenhouse; playhouse; bathhouse; water tower; five-car garage with five-room apartment; and a very long driveway. The property also includes a 1/6 share of the very private Richardson Lake. Hillsdale Farm has been designated a Guilford County Landmark, which merits a 50 percent reduction in property taxes. Its current tax valuation is $1.896 million. The house was built in 1929 by Lunsford Richardson III (a son of the Vicks VapoRub inventor) and his wife, Margaret. It was designed by nationally known architect Richardson Brognard Okie of Philadelphia. “Okie’s Colonial Revival designs were notable in that they applied materials and design features of colonial period structures into new building construction,” Benjamin Briggs of Preservation Greensboro has written. Hillsdale Farm left the Richardson family’s holdings more than 30 years ago, and its original 2,800 acres have been pared down to a more manageable 27. But the house still has the look and feel of one of Greensboro’s most notable historic homes. The back of the house has a distinctly different look. There are other mansions in Fisher Park, but perhaps none of them make the statement the Douglas-Ravenel House does. Overlooking over the park with its towering columns and Neoclassical facade, its says prominence and grandeur in a way that can’t be missed. 106 Fisher Park Circle went on the market yesterday for $1.35 million. Its current owners have given it what the listing describes as a “million-dollar” renovation (after buying it for $770,000 in 2005). The house has five bedrooms and four and a half bathrooms, twin living rooms, a library, dining room, den and eight fireplaces. Outdoor spaces include a spacious front porch, a private side porch and, in the backyard, an English garden and pergola. You can do a lot with 14 rooms, 5,200 square feet and a third of an acre, and the owners have done quite a lot and quite well, too. Their work was honored with a Restoration Award from Preservation Greensboro in 2006. “The Douglas-Ravenel House was constructed in 1912, among the earliest houses in the Fisher Park neighborhood,” Preservation Greensboro’s Benjamin Briggs has written. “Occupying a high south-facing lot overlooking the wooded park, the Douglas-Ravenel House is one of the best residential examples of Neoclassical Revival architecture in Greensboro.” It also has been named a Guilford County Historic Landmark. 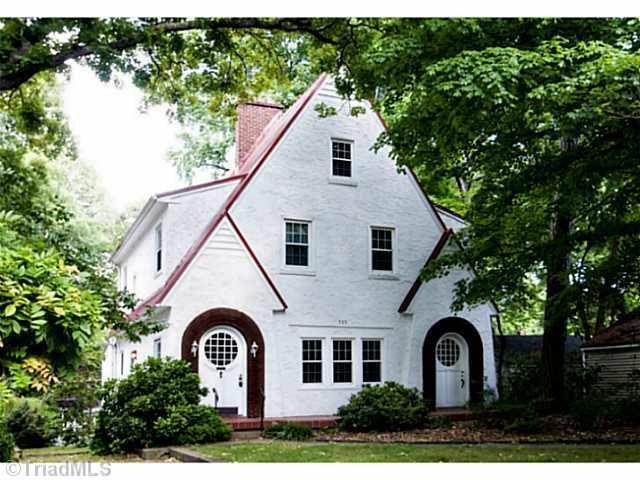 There have been few grand old houses for sale in Greensboro’s historic districts this year. Even if there had been, the Douglas-Ravenel House would be a standout. 200 E. Bessemer is an unusual opportunity: Used as offices for the past 20 years or so, it’s being marketed as either a residence or offices. Converting it back to a home would be relatively easy, as it was never divided up or altered significantly from its days as a residence, aside from the back yard being paved. The property is zoned for office use, which allows it to be used as a residence. The house went on the market this week at $410,000, a reasonable $145 per square foot. It’s known as both the Avalon Center and the A.J. Schlosser House. Built in 1920, it has three bedrooms and a bath and a half. It features two fireplaces with their original tile and mantels, unpainted woodwork, three sun porches (one off the master bedroom) and a relatively new slate roof (installed in 2000). A backyard garage has been converted into a one-room studio. The main house has exterior lighting and an HVAC system with electrostatic air filtration. The front yard has a sprinkler system. The owner clearly has taken good care of the house. It’s hard to miss — an imposing two-story granite house, sitting in a prominent location at East Bessemer and Magnolia Street. Arched stonework decorates the front door and first-floor windows. The driveway passes through a portico on its way back to the studio. The house is in the Fisher Park Historic District. The block is a mix of residences and houses converted to office use. The Craftsman house next door, 208 E. Bessemer, also went on the market this week; that one is for sale only as office space. Across the street are two grand old 1924 apartment houses, the Fairfax and the Shirley. 1033 Pearson Street may be the most attractive older house for sale now in south Greensboro. It was built in 1946, a little later than most in the Asheboro Community. It features brick arches on the front porch and a nicely renovated interior. The house was one of the many cited in the neighborhood’s successful nomination for the National Register of Historic Places in 1991 (listed under the neighborhood’s previous name, South Greensboro). The house is for sale for $89,500. An offer was accepted almost immediately after the house went on the market in May, but it fell through. The house has three bedrooms and two bathrooms. With 1,232 square feet, its price comes out to just $71 per square foot. The interior maintains its lovely period features, such as arched doorways and a breakfast nook. The Asheboro Community was built out mostly from the 1860’s through the 1920s. It was a more middle-class neighborhood than Fisher Park or Irving Park, but the houses included imposing Queen Annes amid the bungalows. Many of the older homes, large and small, are still standing. Like some other prosperous Greensboro neighborhoods of its era, such as College Hill and Dunleith, the neighborhood suffered mightily during the Depression and the decades that followed. Today, renovations are underway on at least one grand old house on Pearson Street, although others are still boarded up or decaying with absentee ownership. Overall, the area shows early signs of a renaissance. If 1033 Pearson is bought to be owner occupied rather than a rental, it will be another step forward. Update: The house sold for $60,000 on July 7, 2017, one month after it went on the market. 507 Park Avenue looks like the best opportunity in Greensboro right now for a buyer who wants to give a historic home a thorough restoration. While the Zillow listing has no interior photos, it includes a quick video walkthrough that provides a good idea of its condition (screenshots below). The Craftsman bungalow is for sale at $79,900, a price definitely down in the fixer-upper range for a home in the Dunleath Historic District (remember, it’s Dunleath now, not Aycock). It has four bedrooms, two bathrooms and either 1,637 square feet (county records) or 2,131 (Zillow). It has been owned by one family since 1961. The house is easily identified by its distinctive front porch, with double columns atop tall brick pillars, and a dormer with somewhat cramped-looking windows. The front yard is in good shape, especially if you love shrubs. A double concrete-strip driveway leads to a backyard garage. Also behind the house are a brick fireplace, clothes line and a small shed. The video indicates the interior isn’t awful but does need a thorough renovation. The listing says it has central air conditioning, but there are a couple window air conditioners as well. 507 Park went on the market Wednesday. If this is the kind of opportunity you’re looking for, get over there Saturday and take a look. Very few properties are for sale in Greensboro’s historic districts this spring, and this looks to be the best renovation candidate on the market. Update: The house sold for $470,000 on June 30, 2017. 814 Olive Street is a Foursquare with a distinctive stone foundation and porch columns. It was built in 1918 and thoroughly renovated over the past two years. It went on the market Friday at $474,900. It will be open on Saturday and Sunday, 2 p.m. to 4 p.m. both days, as Preservation Greensboro brings a couple thousand people into the neighborhood to visit eight other houses for its seventh annual Historic Homes Tour. The renovation of 814 Olive was high end — Thermador appliances, master suite with marble floor and double granite vanities in the bathroom, etc. Also a walk-in closet, something you’re not going to find in many non-renovated Fisher Park homes. The renovation is not unusual for Olive Street. “Over the past few years, the street has seen a make-over that has seen a much needed re-investment into worn housing stock,” Benjamin Briggs of Preservation Greensboro wrote in 2014. The renovations of 808, 810 and 813 Olive Street all have received preservation awards from the organization. 814 Olive has three bedrooms and three bathrooms. A den could be used a fourth bedroom. The house has a sunroom, spacious eat-in kitchen and deck looking out over the deep backyard. At 2,504 square feet, the price comes out to $190 per square foot, lofty but about what one would expect for a restored 1920s home in one of Greensboro’s finest early 20th century neighborhoods. The house sits on a deep, level 0.33-acre lot. Update, September 29, 2017: Miramichi was taken off the market without a sale. Update II, April 6, 2018: The property is listed again. Miramichi, the Kellenberger Estate near McLeansville, was put on the market last week at an asking price of $849,000. It was listed on the National Register of Historic Places in 1994 in recognition of both the house and its remarkable 32-acre grounds. Its period of significance was 1921-44. “It is the landscaping for which Miramichi is best known. The estate is dominated visually by the impressive naturalized landscape of native and exotic trees, shrubs, and flowering plants, many of which remain in remarkably intact condition today,” the property’s nomination states. The landscaping was designed and planted from 1921 through 1944. Included on the grounds are two stone grottos fed by springs (previously a “hog waller”), a curvilinear pool, a lake and dam dating from 1915 and picnic areas. A boathouse and swimming pool were built around 1930. A small log outbuilding and tenant house date from around 1925 and 1930, respectively. The house experienced a transformation of its own. “The house was created by the Kellenbergers, beginning about 1921 using an existing vernacular log farmhouse as the focal point, and continuing into the 1940s with a series of alterations and additions,” the nomination states. John Kellenberger (1886-1973) was a businessman who came to Greensboro in 1911 from Pennsylvania. He was a successful furniture, real estate and finance executive. May Latham Kellenberger (1893-1978) was born in New Bern; the family moved to Greensboro in 1904, and both of her parents became prominent in business and civic affairs. Together, the Kellenbergers figured among the city’s leaders for five decades. Update: The house sold for $238,000 on May 12, 2017. The phrases “split level” and “one of a kind” almost never go together. Creativity and flair were of little interest to the great bulk of homebuyers in the ’50s and ’60s. 900 Forest Hill Drive is an exception. This 1955 split level offers a break from ’50s conformity. The sloping roof gives it an altogether different profile from typical split levels. Even though the interior displays the familiar smaller windows and lower ceilings of post-war style, the home’s horizontal fireplace and built-ins are a break from split-level blandness as well. The home’s appeal is enduring. The current sellers bought it in 2000 from a couple who had owned it since 1959. It went on the market Friday with an accepted offer in hand. If that deal should fall through, it probably won’t be long before another is in hand. The $237,900 asking price works out to a modest $117 per square foot. The details: 3 bedrooms, 2 bathrooms, 2,034 square feet, .71-acre lot, Hamilton Forest neighborhood. Last sale: $179,000, June 2000.